Stronger-than-expected U.S. jobs growth in July included another large contribution from the temporary staffing sector. The fastest growth in U.S. temporary payrolls in more than a year also lifted the temporary penetration rate to its highest level in more than five years. 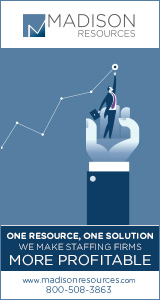 Industry executives and analysts expect the temporary percentage rate to hit a record high soon, reflecting caution among employers amid economic uncertainty as well as a shift in the nature of American jobs. The U.S. Department of Labor reported on Aug. 3 that staffing services added 14,100 jobs last month. The 10% year-over-year growth was the fastest since May 2011. The percentage of temporary workers in the labor force bottomed out in June 2009 at 1.34%. July’s rate of 1.91% was the highest since April 2007. The rate is approaching the peak during the last economic expansion, 1.96% in 2005, and could soon top the April 2000 record of 2.03%. The Joint Commission is reviewing three health care staffing firms it has certified because they placed a traveling medical technician who allegedly infected 30 hospital patients in New Hampshire with hepatitis C. David Kwiatkowski worked at 16 hospitals in eight states during the last five years, even though irregular behavior was cited by two of those facilities. 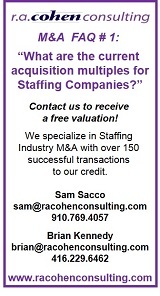 The staffing firms in question are Columbia, MD-based Maxim Staffing Solutions, Phoenix-based SpringBoard Healthcare Staffing, and Omaha, NE-based Triage Staffing. The Joint Commission says these firms must adhere to certain standards, such as verifying workers’ credentials and training, independently verifying their personal references and résumé information, and ensuring they comply with drug-testing rules at the hospitals where they are placed. Although employers hired the most workers in five months in July, an increase in the jobless rate to 8.3% keeps prospects of further monetary stimulus from the Federal Reserve on the table. Nonfarm payrolls increased by 163,000 last month, the U.S. Department of Labor reported on Friday. The Federal Reserve on Aug. 1 sent a stronger signal that a new round of major support could be on the way if the recovery does not pick up. The step-up in hiring left economists divided on whether the Fed would ease monetary policy at its Sept. 12-13 meeting, as had been widely anticipated before the jobs report. “We think the odds are still tilted in favor of more Fed accommodation at the September meeting, and that call obviously remains contingent on economic and financial developments over the next six weeks,” says Michael Feroli, an economist at JPMorgan. The increase in payrolls last month was confirmation the slump in job growth in the second quarter was largely payback for an unusually warm winter that had brought forward hiring into the early months of the year, economists say. As such, this suggests that employment numbers for August could look more like July’s, reducing the pressure for the Fed to take further action next month. “That doesn’t mean they are not going to go, it just means their sense of urgency for pulling the trigger and moving again is marginally less than it was,” says Ray Stone, an economist at Stone & McCarthy Research Associates. Although the July unemployment report was generally favorable, gains in weekly incomes were the worst seen in almost two years. Taking inflation into account, production and non-supervisory employees have seen their weekly wages rise by just 3 cents since March 2010. “It’s not an economy that has a sign of momentum,” says Diane Swonk, chief economist at Mesirow Financial in Chicago. “Hours worked are not heating up, and wages are stagnant.” Employees have only weak bargaining power, and the industries adding the most jobs are the ones that traditionally pay low wages.